It was an intimate (that means quite small) but enthusiastic (that means enthusiastic) audience gathered at the Town Hall of Norwood, to see and hear Mr Nick Lowe, one of the great English singer/songwriters of the last thirty years. Sure he may not be a household name, but he flippin' well should be. 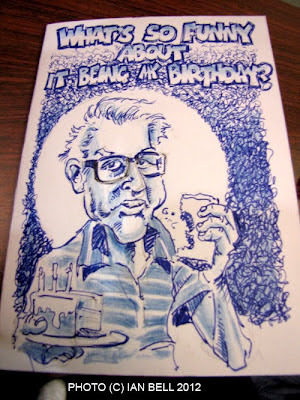 He started his career as part of pub rockers Brinsley Schwartz in the mid seventies. He was the first act signed to legendary punk label Stiff Records, and as their in-house producer was responsible for the sound of classic records by Elvis Costello and the first punk single New Rose by The Damned. As a songwriter he has written a bunch of all time classics including I Knew The Bride, What's So Funny About Peace Love & Understanding, Cruel to be Kind and All Men Are Liars. Johnny Cash was once his father in law. 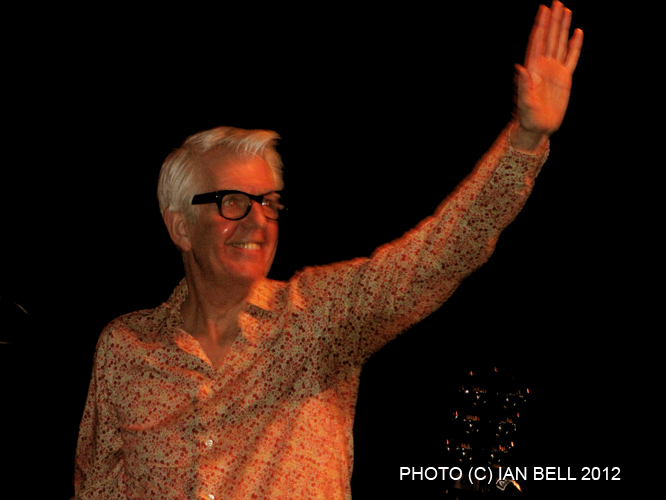 In short Nick Lowe is a pretty cool dude! In recent years Nick continues to produce incredible, if 'humbly' selling, albums full of songs of great warmth, depth and verve. His workmanlike attitude seems to be, if the radio doesn't play your songs, and your not on the telly that much, you have to take your music to the people and hit the road in all directions possible. Fortunate for us. The evening opens with Lowe's touring keyboard player Geraint Watkins as support. "We can't afford a support band," says at one point. After we laugh he continues "..you may well laugh! ", he says referring to the size of the crowd. 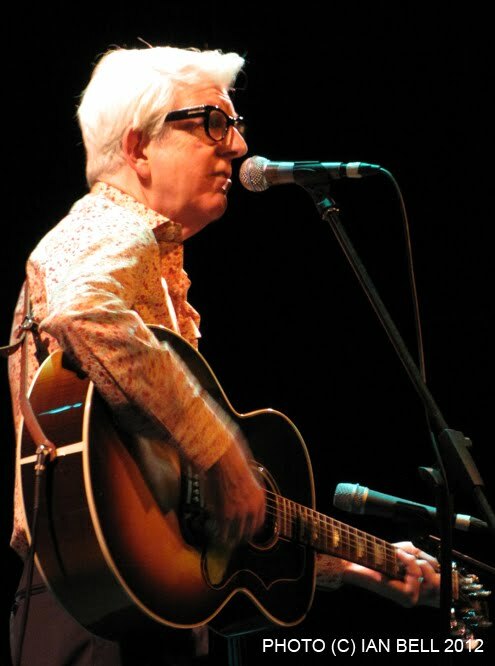 Most people tonight haven't heard Geraint sing before, but his combination of jazz, boogie, old school rhythm & blues and Cajun and a voice like smooth gravel will mean there will be a bunch of us searching out his CD's. The entire audience is eating from the palm of his hand less then half way into his set. 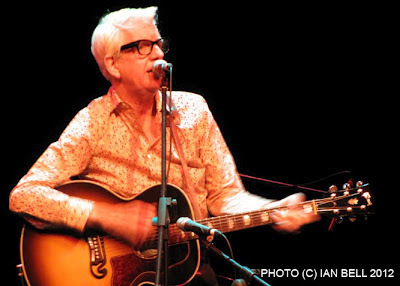 After a short break Nick Lowe arrives and treats us to a couple of acoustic solo numbers Stoplight Roses, from his latest album The Old Magic and his classic Heart from Nick The Knife from 1982. Right from the start it is obvious this is going to be a special night. These days it is extremely rare to see a singer so aware of his own voice, that he allows it to do all the heart work on it's own merits, without straining and having too many effects or sledge-hammering an audience with volume. His voice is rich and textured and put simply, he is a fantastic singer. Somebody yells out "Happy Birthday Nick" as it is his 64th birthday, when we attempt a quick audience version of Happy Birthday to You, Nick is quick to good naturedly wave it away. As his band joins him on the stage he tells us he has a new album out. "I know what you're thinking, why do they do it? You come along to hear the songs you know and they play a bunch of new songs. Well let me assure you these songs have been tested by experts and they are really very good and will blend seamlessly in with the songs you may already know." Nick Lowe wouldn't lie to us. All the new songs really are 'really very good' and apart from being a great singer and raconteur, Lowe is an incredibly underrated songwriter. Yes people know his best known songs, but almost every song he performs tonight is classic A Grade material. You could be forgiven for believing they were written by Bacharach & David, Leiber & Stoller, Ellie Greenwich or a team in the Brill building. He tells stories of love and loss, heartbreak and hurt and delivers them with a melancholia, poison or joy depending on what song it is. So the set is peppered with old favourites like Raging Eyes and Cruel To Be Kind, but many of tonight's high points come from newer songs. I Live On A Battlefield, I Read a Lot and House for Sale are all crushing tales of lost love. But then there's beautiful and touching songs like the excellent Somebody Cares For Me, shows Nick is not all about the heartache and pain. He pulls out a sterling version of Tower of Strength the 1961 hit for Gene MacDaniels (in the USA) and Frankie Vaughan (in the UK). It is so surprising and joyous it takes us off guard. The set finishes with a great slowed down version of I Knew The Bride When She Used to Rock'n'Roll. Nick returns with Geraint to do one of Geraint's own songs Only A Rose. A toe-tapping version of When I Write The Book, is followed by his best known song What's So Funny 'Bout Peace Love & Understanding. 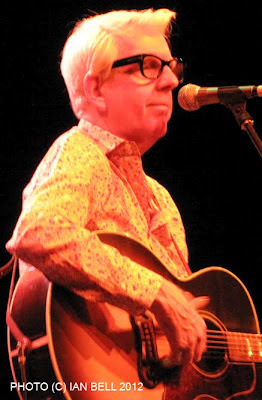 Written by Nick when he was only nineteen, made popular by his long time buddy Elvis Costello, it is the most intelligent non-hippy, anti-war song in pop music history. Hearing one of my all time favourite songs performed by it's original voice, is a treat indeed. The encore concludes with Tokyo Bay. Nick returns with an acoustic guitar and plays a dazzling version of Costello's Alison before bidding us a fond fair well. Shortly after the lights go up a group of people hoping to say hello are ushered backstage, where Basher (as he is affectionately known) signed albums, posed for photographs and shared his birthday cake with the die-hards. A lovely end to a lovely gig.